Following up on an initial report last month, The New York Times now says that Tamiflu is 99% of all flu strains 99% ineffective against the dominant flu strain that will strike Americans this season. Scientists and health officials do not know why. Last winter, roughly 11% of common flu strains patients with the most common flu strain resisted showed resistance to Tamiflu, the leading antiviral drug. No resistance to Tamiflu has been identified among other circulating viruses, according to the Centers for Disease Control and Prevention and Roche, the manufacturer. So far, it’s not a public-health problem. Officials cite two reasons: the flu season has been below average, and the main strain is susceptible to other antivirals. January and February are peak months for influenza. Last month The Wall Street Journal reported that the CDC had alerted doctors about Tamiflu’s apparent ineffectiveness and urged them to prescribe an additional drug. The Food and Drug Administration has more information about Tamiflu. WebMD, citing the CDC, reports the first flu-related death of a child this season. A new vaccine platform that could bring fundamental changes to vaccine technology is being developed by scientists at the University of Copenhagen. Known as the InVacc platform, it improves upon original DNA vaccines and creates new vaccines with enhanced properties. The platform consists of a chain of amino acids attached to a gene of the virus being vaccinated against. This “genetic cocktail” is inserted into an appropriate expression vehicle, such as an incapacitated adenovirus, and injected into the body, triggering a broad and aggressive immune response. The chain of 215 amino acids and its insertion into the adenovirus represent the key innovations of this technique. To date, tests of the vaccine look promising. Researchers were able to provide 100% protection against various lethal strains of flu given to mice. The next phase of development and, ultimately, clinical trials are being planned. Today, during the Institute of Medicine’s (IOM) 2nd National Stakeholder Meeting on the Review of Priorities in the National Vaccine Plan, Stanley Plotkin, Executive Advisor to the CEO of Sanofi Pasteur and Emeritus Professor of Pediatrics at the University of Pennsylvania made a startling revelation: Sanofi Pasteur is lobbying members of the Senate for liability protection. ROCHESTER, N.Y., Oct. 6 — Immunizations did not reduce emergency department visits or hospitalizations for children younger than five during two recent flu seasons, researchers here reported. Looking at data from the 2003-2004 and the 2004-2005 flu seasons, there was no evidence that the immunization made any significant difference, although the vaccine was not a good match for circulating flu strains in those years, said Peter G. Szilagyi, M.D., M.P.H., of Strong Memorial Hospital, and colleagues. The case-cohort study, reported in the October issue of Archives of Pediatrics and Adolescent Medicine, compared cases of acute respiratory illnesses in children six months to 59 months treated in hospitals — as inpatients or in the emergency department or outpatient clinic — with a control cluster sample of children treated at pediatric practices. …The vaccine effectiveness ranged from 7% to 52% across all settings and three age groups (six-23 months, 24-59 months, six-59 months), they said. Earlier studies had suggested that vaccination could reduce hospitalizations or emergency department visits, but those studies were limited by the use of nonspecific endpoints rather than laboratory-confirmed diagnoses or a narrow focus that concentrated on only a single healthcare setting — such as emergency departments — or a single flu season, Dr. Szilagyi wrote. And a year later, when the flu season was less severe and the vaccine was considered a better match, still “only 36% of the virus isolates were antigenically similar to vaccine strains,” they wrote. Moreover, they acknowledged, the case-cohort design may have been a poor choice since it might be particularly susceptible to bias because parents who have had their children vaccinated might be more likely to seek medical care for their children than other parents. Something that can explain why flu epidemics also occur both in warm and cold climates is this: During a flu epidemic, wherever it may be, the atmosphere blocks ultraviolet B (UVB) radiation from the Sun. In the temperate zones above latitude 35 degrees North and South, the sun is at a low enough angle in the winter that the ozone layer in the atmosphere absorbs and blocks the short-wavelength (280–315 nanometers) UVB rays. In the tropics during the wet season, thick rain clouds block UVB rays. Vitamin D also expresses genes that stop macrophages from overreacting to an infection and releasing too many inflammatory agents – cytokines – that can damage infected tissue. Vitamin D, for example, down regulates genes that produce interleukin-2 and interferon gamma, two cytokines that prime macrophages and cytotoxic T cells to attack the body’s tissues. In the 1918–19 Spanish flu pandemic that killed 500,000 Americans, young healthy adults would wake up in the morning feeling well, start drowning in their own inflammation as the day wore on, and be dead by midnight, as happened to my 22-year-old grandmother and my wife’s 24-year-old grandmother. Autopsies showed complete destruction of the epithelial cells lining the respiratory tract resulting, researchers now know, from a macrophage-induced severe inflammatory reaction to the virus. In a terribly misguided way, these victims’ own immune system attacked and killed them, not the virus, something in future pandemics vitamin D, in appropriate doses, can prevent. 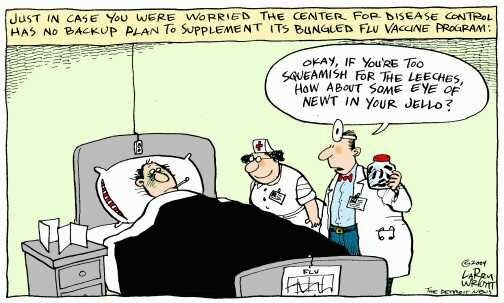 A creditable hypothesis that explains the seasonal nature of flu is that influenza is a vitamin D deficiency disease. Cannell and colleagues offer this hypothesis in “Epidemic Influenza and Vitamin D” (Epidemiol Infect 2006;134:1129–40). They quote Hippocrates (circa 400 B.C. ), who said, “Whoever wishes to investigate medicine properly should proceed thus: in the first place to consider the seasons of the year.” Vitamin D levels in the blood fall to their lowest point during flu seasons. Unable to be protected by the body’s own antibiotics (antimicrobial peptides) that this gene-expresser engineers, a person with a low vitamin D blood level is more vulnerable to contracting colds, influenza, and other respiratory infections (e.g., respiratory syncytial virus). Studies show that children with rickets, a vitamin D-deficient skeletal disorder, suffer from frequent respiratory infections; and children exposed to sunlight are less likely to get a cold. Given vitamin D’s wide-ranging effects on gene expression, other studies, for example, show that people diagnosed with cancer in the summer have an improved survival compared with those diagnosed in the winter (Int J Cancer 2006;119:1530–36). Experts reckon that an optimum blood level of vitamin D (25-hydroxyvitamin D) is 50–99 ng/ml. (Children need a blood level >8 ng/ml to prevent rickets. It takes a concentration >20 to maintain parathyroid hormone levels in a normal range. A level >34 is needed for peak intestinal calcium absorption. And in elderly people neuromuscular performance steadily improves as vitamin D blood levels rise to 50 ng/ml.) The government’s recommended daily allowance (RDA) for vitamin D is 400 IU (international units) a day, an amount sufficient to prevent rickets and osteomalacia but not vitamin D’s other gene-regulating benefits. To achieve all of vitamin D’s benefits one has to take an amount ten times the government’s RDA – 4,000 to 5,000 IU a day. The majority of Americans are vitamin D deficient, with a 25-hydroxy D blood level <20 ng/ml, or insufficient, with a level of 20–<30 ng/ml. Cheap vitamin D supplements (D3, not D2) provide the only way most of us can maintain a year-round vitamin D blood levels greater than 50 ng/ml. That requires taking 4–5,000 IU of vitamin D a day (50,000 IU every ten days or 150,000 IU a month). Taking vitamin D in these doses is safe, far safer than a flu shot with all the bad chemicals it contains. Concerns about vitamin D toxicity are overblown. One can take a 10,000 IU vitamin D supplement on a daily basis without any adverse effects. In healthy persons, long-term consumption of more than 40,000 IU a day is necessary to cause an elevation in the blood calcium level (hypercalcemia), the first manifestation of vitamin D toxicity (Am J Clin Nutr 2006;84:694–97). Check your vitamin D (25-hydroxy D) blood level. People with granulomatous diseases like sarcoidosis should also check their blood level of 1,25-dihydroxyvitamin D, the active form. Doctors in India and Canada give people a once-yearly injection of 600,000 IU of vitamin D (MJA 2005;183:10–12). 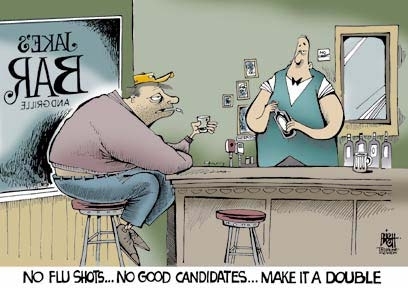 That would be better, and safer, than having a flu shot. Daily, weekly, or monthly vitamin D tablets work just as well. For more on this subject see my article “Vitamin D in a New Light” and visit Dr. Cannell’s Vitamin D Council website. Investigators have completed one double-blind, randomized, placebo-controlled trial that shows vitamin D prevents colds and influenza significantly better (P <0.002) than a placebo pill (Epidemiol Infection 2007;135:1095–6). A large multi-center randomized trial conducted over multiple flu seasons comparing vitamin D to a flu shot can show conclusively which is better, and safer. But given the financial stakes underpinning flu shots, and unpatentable vitamin D, who will fund it? Multi-dose vial, 5 mL, contains thimerosal, a mercury derivative, added as a preservative. Each 0.5 mL dose contains 25 μg mercury. Prefilled syringe, 0.5-mL. Thimerosal, a mercury derivative used during manufacture, is removed by subsequent purification steps to a trace amount (≤ 1 mcg mercury per 0.5-mL dose). Multidose vial, 5-mL. Contains thimerosal, a mercury derivative (25 mcg mercury per 0.5-mL dose). Thimerosal is added as a preservative. 0.5 mL preservative-free, single-dose, pre-filled syringe. 5 mL multi-dose vial containing ten doses. Thimerosal, a mercury derivative, is added as a preservative; each 0.5 mL dose contains 24.5 micrograms (mcg) of mercury. 0.2 mL pre-filled, single-use intranasal spray (3) Each 0.2 mL dose contains 106.5-7.5 FFU (fluorescent focus units) of live attenuated influenza virus reassortants of each of the three strains for the 2008-2009 season: A/South Dakota/6/2007 (H1N1) (A/Brisbane/59/2007-like), A/Uruguay/716/2007 (H3N2) (A/Brisbane/10/2007-like), and B/Florida/4/2006. Thimerosal, a mercury derivative, is added as a preservative. Each 0.5 mL dose contains 25 mcg mercury. Each 0.5 mL dose also contains octoxynol-10 (TRITON® X-100) ≤0.120 mg, α-tocopheryl hydrogen succinate ≤0.1 mg, and polysorbate 80 (Tween 80) ≤0.380 mg. The vaccine is formulated without preservatives. Thimerosal is used at the early stages of manufacture and is removed by subsequent purification steps to a trace amount (≤1 mcg mercury per dose). Each dose may also contain residual amounts of hydrocortisone ≤0.0016 mcg, gentamicin sulfate ≤0.15 mcg, ovalbumin ≤1 mcg, formaldehyde ≤50 mcg, and sodium deoxycholate ≤50 mcg from the manufacturing process. Feb 25, 2005 (CIDRAP News) – An analysis of 24 studies yielded no clear evidence that influenza vaccines prevent flu in children younger than 2 years old, though they work reasonably well in older children, according to a new report in The Lancet. Immunization of very young children is not lent support by our findings,” says the report by T. Jefferson of Cochrane Vaccines Field in Alessandria, Italy, and colleagues from there and the University of Oxford in England. The report comes less than a year after the Centers for Disease Control and Prevention (CDC) recommended that children 6 to 23 months old routinely receive flu shots on grounds that they have an increased risk of flu and its complications. The CDC says the Lancet analysis left out some important studies showing that flu shots are beneficial for young children. The agency will continue to recommend flu shots for 6- to 23-month-olds, a spokeswoman said. Jefferson and colleagues combed the worldwide literature up to June 2004 and found 15 randomized controlled trials, eight cohort studies, and one case-control study comparing the effects of flu immunization with placebo or no immunization in children. The researchers looked at the vaccines’ efficacy, defined as prevention of laboratory-confirmed flu; effectiveness in preventing flu-like illness; and effectiveness in reducing hospitalizations, complications, school absences, and secondary transmission. The authors did separate analyses of studies dealing with live attenuated flu vaccines, which are not used in small children, and those involving inactivated vaccines. The analysis did not include studies assessing children’s immune-system responses to vaccines (serologic studies). In children under age 2, vaccination yielded 24% efficacy against flu, which was not significantly better than placebo, but this finding was based on one study involving about 800 children, the report says. No data were available on the effectiveness of vaccination for preventing flu-like illness in the under-2 group. Among children 2 years and older, live attenuated vaccines were 79% efficacious in preventing flu, while inactivated vaccines were 65% efficacious, according to the analysis. The effectiveness of vaccines against flu-like illness was much lower: 38% for live vaccines, 28% for inactivated vaccines. Differences between efficacy and effectiveness of vaccines are not surprising because influenza vaccines are specifically targeted at influenza viruses and are not designed to prevent other causes of influenza-like illness,” the report states. The researchers found that immunization reduced long school absences, but they saw little evidence that it reduced hospital admissions and stays, secondary cases, lower-respiratory-tract disease, or acute otitis media. Although a growing body of evidence shows the effect of influenza on admissions and deaths of children, we recorded no convincing evidence that vaccines can reduce mortality, admissions, serious complications, and community transmission of influenza,” the article concludes. Kristine Sheedy, a spokeswoman for the CDC’s National Immunization Program in Atlanta, told CIDRAP News that the analysis left out some important evidence on the effects of flu immunization in small children. The authors “included many important studies, but they did exclude other important studies,” she said. She mentioned a CDC study published in Morbidity and Mortality Weekly Report in August 2004 and a 2001 study by K. M. Neuzil and colleagues, published in the Pediatric Infectious Disease Journal. A careful review of the Lancet report itself as well as the excluded studies “indicates that influenza vaccination is effective in this population” (6- to 23-month-olds), Sheedy said. She added that serologic studies of small children have shown a strong immune response to flu vaccine. Also, additional studies soon to be reported by the CDC will provide more support for the effectiveness of flu immunization in preventing hospitalization and outpatient visits in children, she said.